One day, all of a sudden I just started seeing screenshots of a post. You have no idea what it is. You keep reading it and seeing clips on so many profiles on Instagram and Facebook. The only thing most game reviews ever discuss is about Fortnite. It’s a game that has taken the whole world by storm. People from all ages have heard about the game, they’re even busting out dance moves in club from the emotes you can obtain. All I’ve ever heard about is Fortnite. Fortnite. So of course after several weeks of ignoring all the advertisements and recommendations I had to investigate what Fortnite is and download to try it out for myself. What I’ve found will shock you but it will open your eyes. Battle Royale is a new genre of video games that has recently emerged in the past couple of years. The term derives from the Japanese manga of the same name. In the manga of Battle Royale (which contains ultra graphic violence and mature content), set in a dystopian universe in Japan where a randomly selected school chooses the 9th grade student to be sent to an isolated island to murder each other until the last one is left alive. This is where Fortnite takes the premise from. People will be more familiar with the Hunger Games franchise and it also shares the same concept: last man standing. The Battle Royale mode can be played individually or in teams of 2, 3, and 4 to see who is the last people alive. Once eliminated, you’re not allowed to re-spawn and you’ll be sent back to the lobby. There is also Team Royale where it pits 25 vs 25 players with the goal to get 100 eliminations. You start first at battle island which is a loading area to practice shooting and seeing other players for a brief moment before all being transported to the Battle Bus. This is where the round begins. The bus choose to move in a straight line from one edge of the map to the opposite and everyone must select a destination to go to and then jump to skydive. Once descending you can position yourself get to the ground faster by inclining the characters and camera to release your glider, deployable parachute. Immediately upon landing your goal is to find a gun and scavenge for resources (example: ammo and health supplies). Every object in the game is destructible so take out your pick axe to chop down anything to receive either wood, bricks or metal depending on the material. Build forts to defend yourself by creating buildings that will help you gain a better advantage by reaching greater heights, use traps or other tools at your disposal to create. Every item in the game has a color depending on their quality: Grey (common), Green (uncommon), Blue (rare), Purple (Epic), and Orange (Legendary). This game relies heavily on RNG (Random Number Generator) which is basically a system of Chance. This game not only requires skill but a large amount of luck. Everything from loot crates to weapon damage are RNG and this results in a lot of inconsistency or overpowered/unbalanced weapons. At times, even landing a perfect headshot becomes obsolete resulting in low damage. There are countless factors that can cripple a players experience due to having RNG. This also isn’t a good design choice to have implemented for an ESports game. You’re able to even ride golf carts, grocery karts, quad bikes, planes, hover boards, trampoline-like jump pads, balloons and teleporter’s just to name a few. There are many strange objects like the Disco Bomb, where once thrown creates a floating disco ball in the center of its radius and anyone caught begins to boogie down like Saturday Night Fever making them be vulnerable to open fire. The Bush, where you wear a foliage for a camouflage, or the Grappler where it resembles Link’s Hookshot latching onto anything pulling you forward. Fortnite’s popularity also comes from its sense of unique humor. This characteristic makes the experience enjoyable and also a reason why it’s become so iconic. It’s not the most beautifully made game but it has its own cartoonish charm to it. Everyone learns that Fortnite has a large amount of emotes where people do ridiculous dances and might even get to see someone at your local club busting out Fortnite dance moves. The Fortnite store is huge, boasting a large amount of skins, emotes, and other apparel to purchase. Fornites business model revolves around Free to play but also includes a premium subscription, called a “Season Battle Pass”. 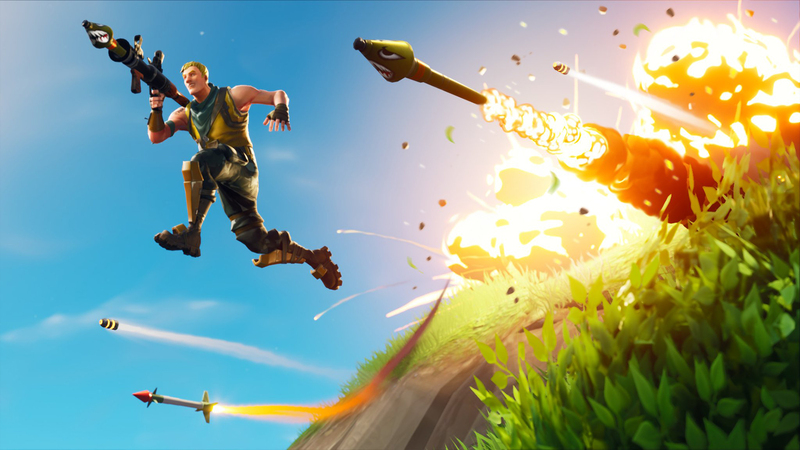 Every 10 weeks a new Season is introduced to Fortnite which brings additional content. is a new way of purchasing additional content. To buy it will cost around 900 VBucks (which is equivalent to $9 USD) which will give you Skins, Emotes, Music, Gliders, Backpacks or Animal Companions, Wallpapers, Weekly Challenges. The more the user plays and successfully completes challenges they will unlock rewards, even granting users the opportunity to earn approximately 20 V Bucks and over 70 cosmetics to your account. If the player has dedicated enough time to reach level 100 during the duration of the season, they will be reward with the next season pass absolutely free. allowing them to redeem the money and time invested into receiving another subscription for the next couple of months. It’s extraordinarily accessible, being the game have brought the Battle Royale formula of 1 vs 99 players to everyone on Playstation, Xbox, Nintendo Switch, Mac, PC, Android and iOS devices absolutely free.